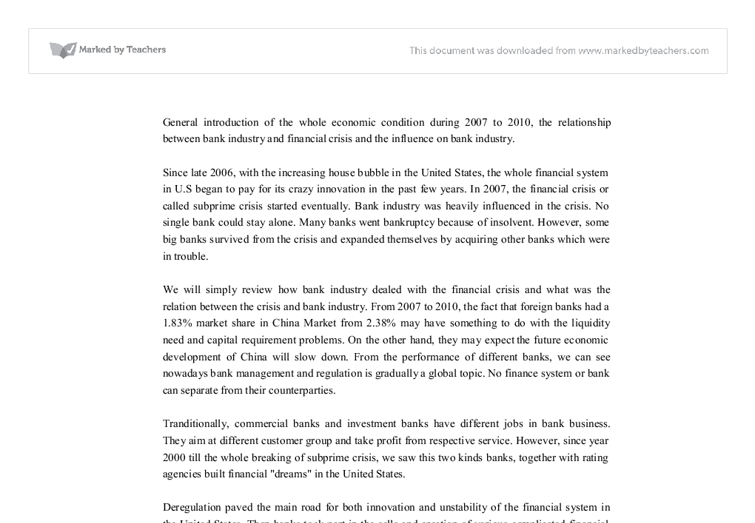 General introduction of the whole economic condition during 2007 to 2010, the relationship between bank industry and financial crisis and the influence on bank industry. Since late 2006, with the increasing house bubble in the United States, the whole financial system in U.S began to pay for its crazy innovation in the past few years. In 2007, the financial crisis or called subprime crisis started eventually. Bank industry was heavily influenced in the crisis. No single bank could stay alone. Many banks went bankruptcy because of insolvent. However, some big banks survived from the crisis and expanded themselves by acquiring other banks which were in trouble. We will simply review how bank industry dealed with the financial crisis and what was the relation between the crisis and bank industry. From 2007 to 2010, the fact that foreign banks had a 1.83% market share in China Market from 2.38% may have something to do with the liquidity need and capital requirement problems. ...read more. At the same time, banks gave high risk loan to people who had a great probability that they would not afford to pay the loan. Banks made the loan rate floating that those who got the loan would pay the lower rate at the beginning. 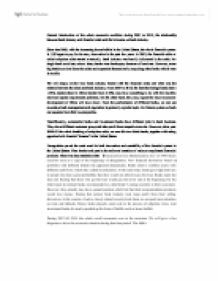 On the other hand, investment banks recommended so called triple A rating securities to their customers. However, they actually may have opened position which bet that their recommendation products would lose money. During that period, bank industry took large profit from their selling derivatives. In the context of such a closely related security food chain, no one paid more attention on risks and defaults. Hence, banks played a main role in the process of subprime crisis. And investment banks obviously speeded up the form of bubble such as house bubble. During 2007 till 2010, the whole world economics was in the recession. We will give a few diagrams to show the economic situation during that time period. ...read more. takes control of Fannie Mae and Freddie Mac September 15, 2008 Lehman Brothers bankruptcy September 15, 2008 Merrill Lynch announces its sale to Bank of America September 25, 2008 WaMu fails, is seized by FDIC, and is sold to JPMorgan Chase Source:http://timeline.stlouisfed.org/index.cfm?p=timeline In the following part, we list price diagrams of several diversified banks. During QE1 and QE2 period, people estimated the whole world economic situation would go through v-shaped bottom. The fact is not so optimistic DBK (currency: EUR) GS(currency: USD) Source:Bloomberg Source:Bloomberg HSBC(currency: GBP) BofA(currency: USD) Source:Bloomberg Source:Bloomberg From the diagrams above, we can see the price level of such big banks has almost slumped to the lowest level range during 1H, 2009. The world economic recession looms ahead of main economy unions. Europe debt crisis and US debt problem make investors confusing and worrying again. In the past two week, the USD index rallied to a high level since Jan, 2011. ?? ?? ?? ?? ...read more. One of the most obvious changes is the change in how the applicant was addressed. Both in 1960 and 1970 the applicant were addressed mainly indirectly with third person pronouns such as he/his. General Motors, Ford and Toyota. > Mercedes-Benz in China In 1986, Mercedes-Benz (China) Motor Sales Co., Ltd. was established. So far, more than 150 authorized sales centers and authorized services centers were founded in about 70 cities in China (Mercedes-Benz.com, 2010). There are dozens of models of Mercedes-Benz which are driven in the Chinese highway, including S-Class, C-Class, E-Sedans, and so on. Moreover, a perspective growth in production of coffee beans in China appealed to Starbucks' investment. Since 1988, when a project of coffee growing area began in Yunnan province, the production growth of coffee beans has increased rapidly. In 1995, it reached 4,000 hectares and more than doubled by the end of 1998 (Dharmananda, 2005). The British economy is also boosted by the production of North Sea oil and gas, which have reserves with estimated value of £250 billion in 2007. Compared with this, though competitiveness fell from 2000, employment still grew speedily driven by the construction boom (Kelly, 2010, p.7). It indicates that the development of Irish economy was in an abnormal way. To be specific, more and more people got involved in the construction boom either by building houses, selling houses or buying houses.